In this section you will learn about Shepherd’s Meadows Policies and Procedures. 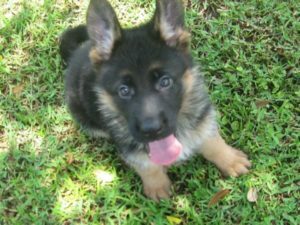 If you are interested in purchasing a top line German Shepherd Puppy, check out the For Sale section to see what animals are currently available or Upcoming Litters to reserve a pup. Please note that often our pups are sold before the litter arrives, so you may have to be on a waiting list. It’s very important that you reserve your puppy as early as possible and you can do so by submitting a $300 deposit online via Paypal. We also accept money orders and certified checks. At Shepherd’s Meadow, we strive to make the puppy purchasing process as easy, stress-free and as comfortable as possible. We want a safe, happy, healthy and loving home for our pups. We will only place our pups in homes where they will primarily reside indoors with plenty of room to roam outside and/or with owners who can exercise with them regularly. (German Shepherds should not be chained to houses or structures. This breed loves interacting with its family so its essential that you consider your new pup as part of the family…a true “man’s best friend”). Reserve your puppy ($300 deposit). You may visit the kennel at any time. Your pup is ready to go home at 8-weeks. All of our German Shepherds are State Health Certified and include First Series Of Shots. We offer a Hip Guarantee for 1 Year plus Lifetime Breeder Support.